Oscar Robles has been named the new head coach at Nogales. (La Puente) – Oscar Robles, who was the head coach at Workman last year, was named the head football coach at Nogales Robles confirmed. Robles, who was an assistant at Northview under Marcel Perez before taking over at Workman last year, led the Lobos to an overall record of 4-7. Workman fell in the first round of the CIF Division 13 playoffs to Santa Clara. Robles takes over for Richard Salazar who led Nogales to a record of 10-2 and a first round playoff victory. Nogales lost in the second round of the Division 13 playoffs to Silver Valley. 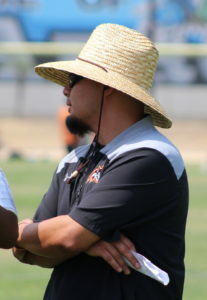 Salazar took the head coaching job at Fullerton. 1 Comment to "Nobles Name Robles"
@ SGV: I appreciate your reply. I believe that the voters in the Whittier Union High School District passed a bond measure several years back to pay for those two new stadiums—the one at Pioneer High and another at California High School. I’ve seen Pioneer’s stadium; it’s quite nice. Those stadiums are pretty lavish by our standards, and I imagine they would even be considered presentable in Texas (where high school football is really big).